Welcome to Two Cats Witchery! 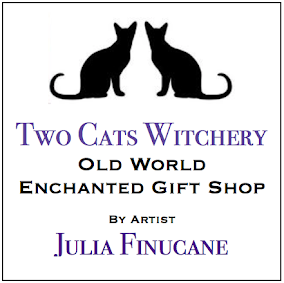 Two Cats Witchery specializes in fantasy themed artwork and crafts as well as handmade metaphysical, spiritual, Witchcraft, Wiccan, Pagan, and ritual supplies. Tarot readings, spiritual services, and classes are also offered here in the shop. Have a question, please visit our FAQ's. Every piece of artwork or craft is created in the home studio of artist and owner, Julia Finucane. Spiritual items and supplies including herb blends, ritual oils, sacred candles, salts, etc. are all handcrafted from Julia's personal spiritual recipes. 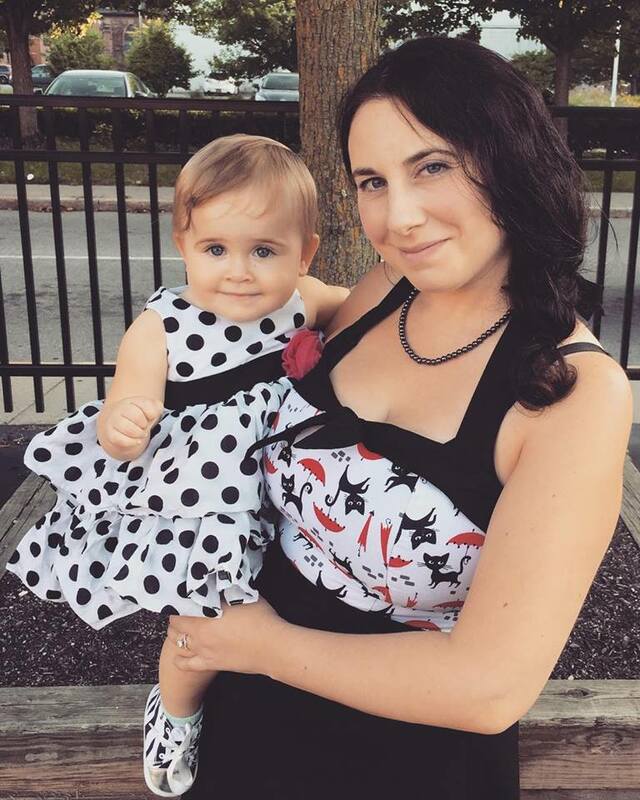 A creator at heart, Julia loves experimenting with different mediums, tools, and natural ingredients. You will find new items in the shop often. Julia puts her heart, energy, intuition, and soul into everything she does and every item she creates. If it's a painting, a trinket box, a doll, herb mixtures, or ritual oil; each ingredient, material, or recipe is hand made or mixed by Julia. Always having a love of different cultures and spiritual paths, Julia tries to incorporate her spirituality into her everyday life. 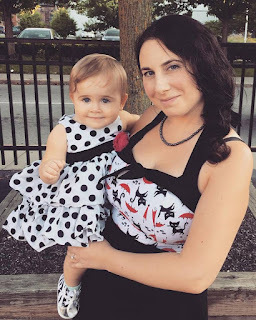 Being raised Irish Catholic in an Irish and Italian home, she has a strong connection to the spirit world, the saints, and family traditions. Her fathers side, comes from a long line of Celtic Pagans and recently descovered Viking ancestors. Her mothers side comes from Sicilian and Italian heritage. As a young child, Julia was read and taught of Irish folklore, family traditions, and old world beliefs. She was taught of the afterlife, and looks to passed loved ones and family for help and guidance. While at college, she studied the many world religions including Eastern and Western religions, Pagan beliefs, Witchcraft, Spiritualism, and the beliefs of the Roman and Greek Empires. This is also where she started studying Tarot in-depth. All these factors and teachings have influenced and still influence Julia's everyday life and beliefs. You will find a blend of saint imagery, oils, candles, angel cards, herbs, loved ones photo's, and Goddess candles around her many sacred spaces in her home. Being an artist at heart, Julia received her degrees in art, art teaching, and computer design. She has been a professional artist ever since, showing her artwork in galleries all over. You will find her artwork here in the store. The name Two Cats Witchery was inspired by her love of animals and her two cats, Penelope and Fiona. These two black beauties represent to her good luck and love, so why not name a shop after them. Julia is also a huge animal advocate, especially when it comes to bully breeds and black cats. Black cats hold horrible and ridiculous stereotypes of being bad luck, evil, or from the devil. Because of these beliefs held by some, black cats are usually the last to be adopted and have the highest rate of euthanasia at some shelters. She hopes to enlighten those and show that no matter what color the cat; they are loving, caring, and great animals to have. All items in this shop are Cruelty Free. Our items at Two Cats Witchery are for every one to enjoy, no matter what faith or spiritual path one might follow. We do not discriminate, and one does not have to be a witch, pagan, or Wiccan to use our products. Many are artwork pieces and decorations as well. We strive too bring you only the finest quality of products and hope that you will enjoy all the lovely items offered. We are a family business and are proud to say we have a personal touch in every process of getting your items to you. "As the artist and owner of Two Cats Witchery, I strive to provide one of a kind, unique handmade items. If you have any questions, please contact us. We also do special and custom orders to suit your needs." Join us for updates on our Facebook and Instagram. *Please Note: Julia recommends learning and doing research before performing any ritual or spell. Please read our legal notice before purchasing and FAQ's page for any question you might have.